Natural hazards have always been present. Their impact on people and their livelihoods have been well documented only where people live. They remain undocumented where no people live. With increasing population, the enhanced use of the coastal zone for various purposes the risk has increased: people loose their lives, their livelihood and are effected by the economic impact to the hazard. Increasing population pressure on the coastal zone – more people moving to the coast because of enhanced economic development through increased use for transport infrastructure, tourism, industry settlements – increases the risk and vulnerability. The interaction between the population and its requirements and demands and the variability of nature will further intensify. Reducing the vulnerability, though, requires the response of how people are prepared for the hazard. Natural hazards are localized, vary with time and due to their rare nature as extreme events escape proper statistical treatment. Changing source functions for extreme events, i.e. due to climate change, change the nature of the hazard. Their statistics may change but remain uncertain. Today science has advanced to a point where hazards and risks can be adequately defined. This proposal addresses the need to provide quantitative information on the nature of the hazard and the risk for different key areas of Russian Europe. Coastal zones are characterized by extremely high concentration of the World’s population (?50% producing >70% of the GWP). Integration of the coastal structures into the economy goes far beyond coastal regions per se, stresses on the economy and life conditions of the coastal zones crucially impact on the economy and life conditions in the inland regions. All these make coastal zones highly vulnerable to natural hazards with the key concerns being that sea level rise or changes in maritime storms cause flooding resulting in inundation and subsequently land loss. Responses to sea level rise have implications for water resources, and the ecological balance in the coastal zone with its ocean part and the neighboring land part. Coastal wetland ecosystems (salt marshes and mangroves) are particularly vulnerable to rising sea level because they are generally within a few centimeters of the sea level (IPCC, 2007). Wetlands provide habitat for many species and play a key role in nutrient uptake Coastal zones are particularly vulnerable to effects from climate variability and change. According to IPCC (2007) the frequency and intensity of extreme events and associated natural hazards in coastal zones (storms resulting in coastal erosion and extreme floods associated with storm surges, extreme rainfalls and anomalous discharges) is projected to increase under the climate change conditions in the 21st century. Besides direct impacts on livelihood and economy, these events impact water availability and quality. IPCC Technical Paper “Climate Change and Water” (2008) with high confidence states that changes in extremes including floods and droughts will affect water quality and exacerbate many forms of water pollution with possible negative impacts on ecosystems, human health, and water system reliability. The existing water management practices cannot satisfactorily cope even with current climate variability and are definitely not capable of coping with the impacts of future climate change on water supply, agriculture, energy and aquatic ecosystems. Furthermore, hazards in coastal zones may critically change the soil geochemistry affecting agricultural potential of large areas. A changing regional hydrological cycle can impose critical changes in the ice and snow balances of glaciers in the coastal mountain regions, implying hazards relating to avalanches and snow slides. Changes in the phase state (rain, snow, ice, permafrost) due to temperature changes can have large-scale effects on the soil composition and soil chemistry and their interaction with the atmosphere. In other words, extreme events in coastal zones have a compound nature, when different natural factors interact with each other resulting in disastrous hazards. The coastal zones in Europe, including European Russia, are highly exposed to the direct impact of sea level change, ocean storm surges as well as to both local and remote changes in the hydrological cycle, which also to a large extent originate from the oceanic signals. The Russian coastal zones are characterized by strongly different conditions implying large differences in the nature and character of extreme events. This requires very different approaches to the risk assessment of natural hazards in the marginal Arctic coasts and the inland sea coasts in the Baltic, Black, Azov and Caspian seas because approaches relevant for one area may not necessarily be effective for the others. Assessments of risks of the natural hazards in coastal zones are extremely difficult unless the end-to-end understanding of all natural factors at great detail is established on the regional level. Thus, it is very timely to undertake comprehensive research which will identify and fill the gaps in our understanding of the nature and impact of extreme events in the coastal zones and that will provide quantitative projections of risks to disastrous natural hazards (floods and droughts, deficit of water resources, degradation of soils, cryosphere-related events) for different regions. The complexity of coastal extremes and difficulties of managing associated risks originates from the compound nature of these extremes (Figure 1). Coastal storm surges result from the extreme nearshore and offshore wind storms. Affecting coasts, storm surges interact with water imbalances imposed by the local precipitation and river runoff in the river delta and mouth regions. River runoff is influenced by precipitation (both local and upstream) and by melting snow and ice in the catchment basins. In many coastal areas these phenomena may be superimposed with tides. The resulting coastal flooding integrates all effects and the severity of floods and extreme sea level elevations can not be properly quantified unless all factors are accounted. The complex nature of coastal extremes makes their impacts also compound. Sea level rise and coastal flooding affect the regional biogeochemistry of soils changing characteristics of biogeochemical barriers. Furthermore, transgressions, in combination with storms, lead to the formation of barrier-lagoon systems (Kroonenberg et al. 2000). When not enough sediment is available, barriers may be overstepped by sea-level rise. This results in waterlogging and salinification of soils and in concentration of minor chemical elements in lagoonal sediments. Alternatively, regressions lead to drying out of lagoons, coastal advance, and are characterized by very low storm related barriers (Kasimov et al. 2000). These phenomena may drastically change the agricultural potential of the soils and place regional biogeochemical balances at the point of no return. 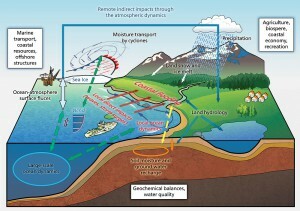 Figure 1 – Schematic representation of different processes and impacts in the coastal zone. Changes in regional biogeochemistry critically affect regional water resources, first of all the quality of drinkable water, which is also critically dependent on extreme hydroclimate events, in particular on the recharge of ground water. Changes in the recharge from surface water due to climate change, along with a simultaneous increase in the pumping rate can cause a catastrophic drop in groundwater levels and drying of the main aquifers used for water supply (Zektser and Everett 2007). Ground water responds more slowly than surface water to changes in climate parameters. Therefore, to accurate assess ground water resources we need to consider longer time scales. Ground water is mainly recharged by local and remote precipitation. The sensitivity of ground water levels to temperature is high where the confining layer is thin (Chen et al., 2004). Furthermore, the recharge of ground water (and availability of clean water resources) largely depends on the physical properties of the soil, the extent to which the soil type is exposed to erosion and on the regional hydrogeology. Although most soil and hydrogeological characteristics were quantified for many European regions, there has been no attempt yet to associate these quantities with climate changes and, thus, to establish a comprehensive assessment of the risks of climate change for water resource availability and management. Today, when we are facing critical risks in water resource management, it is time to undertake such a multidisciplinary study. Changing marine storminess in the coastal zone impacts on the effectiveness and safety of marine operations and off-shore structures, including oil and gas platforms, contributes to the erosion of coasts, thus affecting their potential for the economy and recreation. Erosion threatens both high and low ocean sides resulting in the catastrophic sliding at high sides and to the inundation of the low sides. Many sea shores are currently eroding up to 1 meter per year, increasing shore’s vulnerability to storms, by removing the beaches and dunes that would otherwise protect coastal property. Coastal extremes have an immediate and disastrous impact on economy and life conditions. This implies very specific requirements to the risk management practices in coastal zones. On one hand these should address the compound character of the extremes. On the other hand, they should also account for the considerably varying regional characteristics of the coastal zones. Extreme events in coastal zones involve several mechanisms and phenomena, most of which directly or indirectly are linked to the ocean processes. The ocean impact on the coastal zone is two-fold. First, the ocean provides direct strongly localized impacts through the mechanisms of wind waves, tidal motions and coastal dynamics. Secondly, playing a key-role in the global energy and water cycle, the ocean largely determines atmospheric circulation pattern and associated hydroclimate phenomena, such as extreme precipitation and temperature conditions over the continents, including coastal zones. Both mechanisms experience strong natural and anthropogenic changes and can also interact with each other, since the local off-shore wind patterns are largely influenced by larger scale changes in atmospheric circulation. Marine storminess represents the core of the direct local ocean impacts and originates from the off-shore winds. According to Gulev and Grigorieva (2004, 2006), Woolf et al. (2006) and Wang et al. (2004) during the last several decades there has been a tendency of growing mean and extreme significant wave height (SWH) over the North Atlantic and North Pacific with a maximum of 10-12 cm per decade (Figure 2, Gulev and Grigorieva 2006). Furthermore, in the coastal areas the trends are typically higher than in the open ocean regions, being of up to 20 cm per decade. Importantly, wave extremes typically grow faster compared to the mean values. For instance, for the Barents and Black Seas 99th percentile of SWH was nearly doubled during the last 5-6 decades, while the mean values increased by 20-25%. 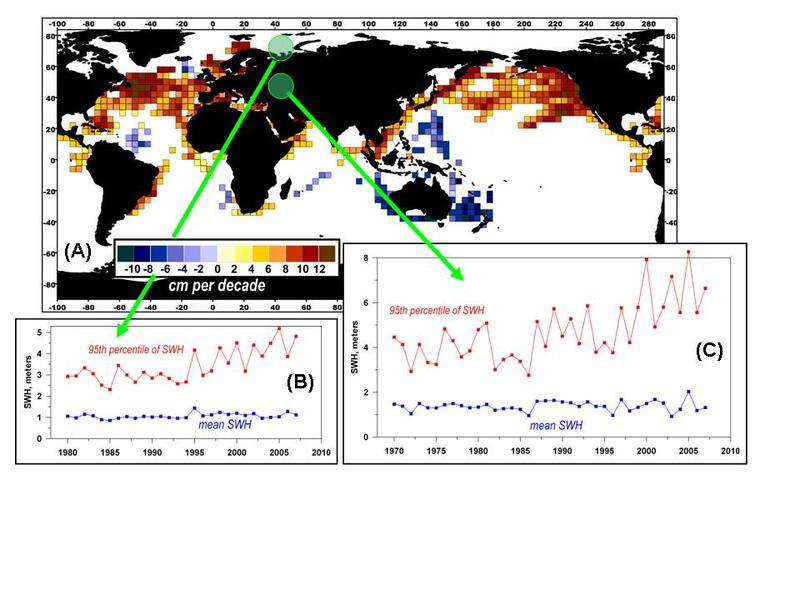 Figure 2 – Linear trends in the mean SWH for the period 1950-2005 (cm/decade) (Gulev and Grigorieva 2006, IPCC 2007) (A) and interannual time series of the mean and extreme (95th percentile) SWH in the Barents Sea (B) and Black Sea (C). In contrast to the mean values, extreme SWH shows clear upward tendencies during the last decades. Figure 3 – Estimates of the return values of the extreme sea level in the Barents Sea from 10-yr hourly data. 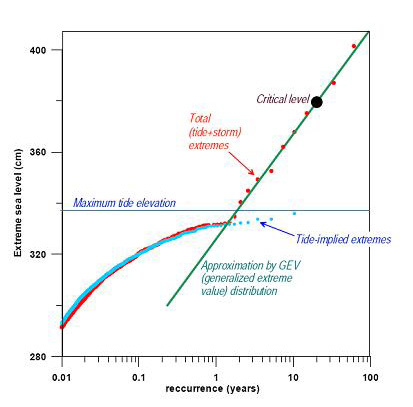 Red circles denote total sea level return values estimated from GEV distribution and blue circles denote extreme tide returns. Purple line shows extreme tide limit. Black circle is the estimated critical sea level, corresponding to the life time of oil platform (approximately 20 years). Extreme waves in the coastal areas may originate, besides the local winds, from the interaction between waves and coastal currents, frequently resulting in the sharp increase (up to 50-100%) of the waves magnitude and generation of the so-called freak waves. Coastal currents themselves represent highly variable components of the ocean dynamics and can significantly contribute to the storm surges interacting with tidal motions. However, the relative role of the mechanisms contributing to the extreme storm surges and the interaction between them is still poorly understood on a quantitative level. Although it is generally clear that meteorological factors dominate over the tidal factors in the generation of the local extremes, regional manifestations are still not obvious. Figure 3 shows an example of the analysis for the Barents Sea station (Kulikov et al. 2010) demonstrating that extreme tide elevations approach the level of saturation at approximately 2-5 year return period, while the total (tide + storm) extreme sea levels grow sharply beyond this level in agreement with approximation by Generalized Extreme Value (GEV) distribution. To quantify the relative role of tides and meteorological factors in forming storm surges in different regions an accurate analysis of data and a proper setting of the hierarchy of the mesoscale atmospheric, ocean dynamics and wave models are needed. These models are relatively well developed and provide the wide range of configurations. They are represented by the atmospheric Weather Research and Forecasting (WFR) model (Skamarock and Klemp, 2007), a variety of regional ocean configurations (e.g. Weisse and Pluess 2006) and several advanced wave models (WAM, SWAN, WAVEWATCH, Cavaleri et al. 2007). However, for every individual region (the North Sea, Baltic Sea, Barents Sea, Black Sea) the choice of the best configuration is an unresolved scientific task dominated by regional features (Weisse et al. 2009). 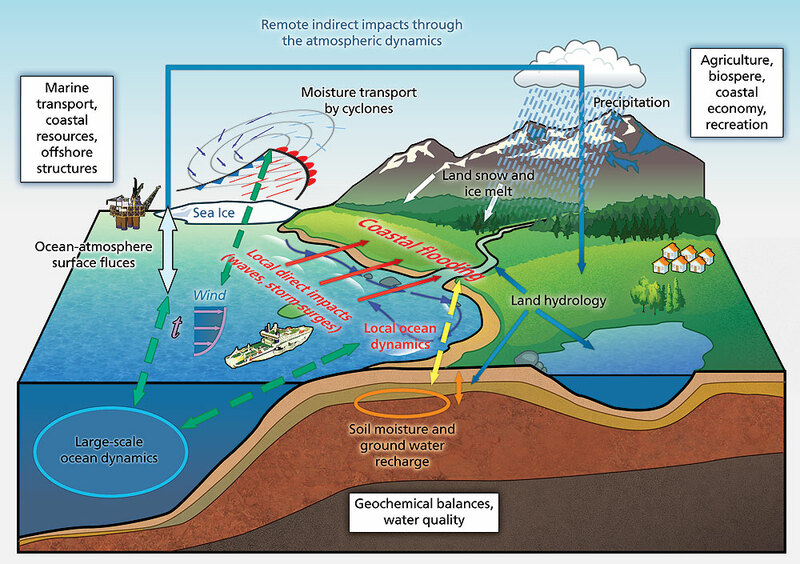 Besides the local direct impact, oceans affect the coastal zone through the large scale mechanism associated with changes in hydrological cycle (Figure 1). Despite considerable progress in understanding and quantifying hydrological cycle (e.g. Trenberth et al. 2009), its individual components are still poorly known even on continental scales. The uncertainties of estimates of hydrological cycle sharply increase when relatively short time scales (weekly, daily) are considered. Importantly, these are the very scales on which extreme climate and weather events and associated floods and droughts occur. To estimate quantitatively the probability of hydrological extremes in different coastal regions, we need firstly to explicitly quantify the ocean-atmosphere energy and mass exchanges in the North Atlantic under the influence of ocean properties and circulation changes (Koltermann et al. 1999, Gouretski and Koltermann 2007) and surface atmospheric variability (Gulev et al. 2007). Next, we need to provide insights on the mechanisms transporting Atlantic heat and moisture to Europe and, finally, we need to associate the characteristics of anomalous moisture transport to European Russia with the local extreme precipitation and flooding. All three components of this triad are poorly known and this is why the present understanding of the ocean’s role in forming continental hydroclimate extremes is primarily based on the simplified metrics of both ocean signal (mostly represented by Sea Surface Temperature (SST), e.g. Kushnir 1994) and atmospheric responses quantified through the mean circulation patterns such as North Atlantic Oscillation (NAO, Hurrell 1995). Low skills these simplified metrics represent the major drawback for the quantification and prediction of the environmental changes under the influence of ocean processes. In other words, in a simplified paradigm we have approached the level of saturation, mirroring the very unfortunate situation when the concept became “more simple than the nature” (citing the famous Einstein’s idiom). In order to engage ocean-related processes into understanding of hydroclimate extremes we need to explicitly associate ocean long-term dynamics with surface fluxes and not with SST and to understand which cyclones and by which mechanisms transport moisture to European continent (Dacre and Grey 2009, Rudeva and Gulev 2010). Furthermore, realistic estimates of the local precipitation extremes especially in the coastal zones require advanced statistical metrics, which should account for the structural changes in the precipitation and for limitations of data sets used (Zolina et al. 2009, 2010). The increase in the frequency of the most intense precipitation by 20-25% over the last five decades (Zolina et al. 2008, 2009, Groisman and Knight 2008) was not generally associated with increased total rainfall, thus averaged precipitation provides little insight for identification of tendencies in extremes. Finally, changes in the occurrence of hydroclimate extremes should be related to the occurrence of floods in coastal regions. Although lood risk and vulnerability in Europe are likely to have grown in many areas, this general assumption does not hold for individual regions. For instance, increasing intensity of heavy European precipitation does not correlate with the long-term series of floods on the major rivers (Mudelsee et al. 2003). Flood risk is highly localized, especially in coastal zones where great care is required to properly associate these disasters with large-scale climate signals. Climate model projections show that the midlatitudinal hydroclimate extremes will likely intensify and become more frequent for the 21st century under all emission scenarios (IPCC 2007, Kiktev et al. 2003, Scaife et al. 2009). Growing precipitation in midlatitude and polar coastal zones interacting with increasing snow and glacier melt and with intensifying wind storms will result in more intense flooding, especially in the polar coastal zones. Considering the indirect ocean impacts, the global water cycle has been accelerating over the last decades with ocean evaporation and global precipitation growing by about 2-3% per decade (Yu and Weller 2009, Gulev et al. 2010). Regional acceleration of the water cycle in Europe is even faster amounting to 3-4% per decade. Allan and Soden (2008) project even faster tendencies for the 21st century that implys a growing frequency and intensity of associated hydroclimate extremes. These projections, being quite robust on average, exhibit, however, a very large spread and give little confidence in particular coastal regions. This is not surprising given the large number of mechanisms involved. Even in the advanced climate models such mechanisms as regional water vapor recycling and changing cyclone life cycle are poorly resolved. Furthermore, in IPCC AR4 changes in wind waves, regional ocean currents and ground water recharge are not accounted for and will not be targeted in AR5. Recently Anderson et al. (2010) clearly stated that coastal impacts of climate change are obviously underestimated, since too much emphasis is placed on magnitudes of changes and too little on rates of changes. Thus, scenario climate projections require regionalization or downscaling to regional scale. Importantly, the downscaling is just partly a resolution issue – on small scales there are conceptual drawbacks in large scale climate models, which can only be addressed with the models of another level of complexity such as non-hydrostatic atmospheric models, coupled wind wave – ocean dynamics models, soil moisture and groundwater flow models (Harbaugh 2005, Maxwell and KoIlet 2008). Moreover, realistic adaptation of these models to specific coastal areas requires extensive use of observational data for validation purposes. In the modeling strategy suggested for IPCC AR5 the development of regional projections of the compound extremes in the key-regions most vulnerable to climate change is the highest priority of regional climate prediction. Coastal zones of European Russia represent very regions of this kind where different forcing factors interact in highly non-linear way, implying also strongly non-linear responses and hardly predictable risks of regional hazards, including critical changes in local vegetation, soil morphology, geochemistry and water quality. These are considered as prime candidates for case studies for hazard and risk assessments.